Researchers from the University of Burgos (Spain) have developed a fluorescent polymer that lights up in contact with mercury that may be present in fish. 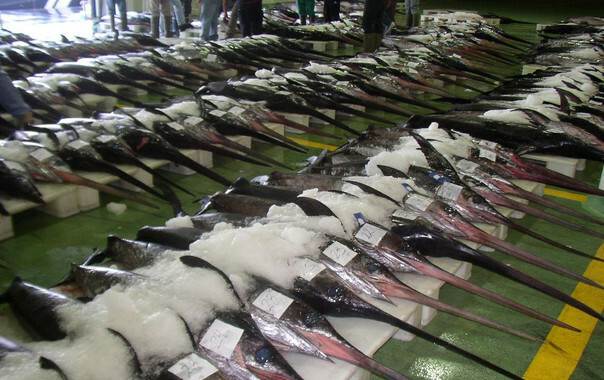 High levels of the metal were detected in samples of swordfish and tuna. According to the conclusions of another Spanish study, mercury exposure is linked to reduced foetal and placental growth in pregnant women. The presence of the toxic metal mercury in the environment comes from natural sources, however, in the last decades industrial waste has caused an increase in concentrations of the metal in some areas of the sea. In the food chain, mercury can be diluted either in organic form as methylmercury (MeHg+) or as an inorganic salt, the cation Hg2+. Swordfish auction in the fish market of Vigo (Spain). Now, researchers from the University of Burgos have created a fluorescent polymer, JG25, which can detect the presence of these two forms of mercury in fish samples. The development is published in the journal 'Chemical Communications'. "The polymer remains in contact with samples extracted directly from the fish for around 20 minutes. Then, while is being irradiated with ultraviolet light, it emits a bluish light, which varies in intensity proportionally to the quantity of methylmercury and inorganic mercury present in the fish," explains Tomás Torroba, lead author of the paper. A portable polymer probe, which can be used in situ, was used to apply the technique to 2-gram samples from a range of fish species. The qualitative relationship between the mercury levels in fish and the increased fluorescence was verified using chemical analysis (called ICP-Mass). The research showed that the larger is the fish the higher are the levels of mercury: between 1.0 and 2.0 parts per million for swordfish, tuna and dogfish, around 0.5 ppm in conger eels and 0.2 ppm in panga. No mercury was found in farmed salmon. These are large fish and at the top of the food chain, but the metal is not present in captivity due to the lack of an industrial or natural source. The toxicity of fish depends on the amount mercury found in the fish presented in the diet. According to the recommendations of the European Food Safety Authority (EFSA), the tolerable weekly intake of methylmercury should be no more than one serving containing amounts over 1.6 µg/kg (micrograms per kilogram of fish) or 4 µg/kg for inorganic mercury (this amount is close to the one detected in the study). However, the current trend for this limit is to be lowered. For example, the United States food safety agency, the FDA, goes beyond this and recommends consuming no more than one portion per week of fish containing concentrations over 1 µg/kg, a tendency other countries are likely to follow. From left to right, polymer samples of JG25 in contact with water (JG25), a solution with Hg2+ and fish samples (tuna, swordfish, conger eel and panga). "Contamination of above 0.5 ppm in a food is already thought to be a considerable level," Torroba explains. "Several of the fresh tuna and swordfish samples we analysed exceed and even double this amount. This is why experts recommend that pregnant women reduce their weekly intake of certain types of fish, such as swordfish, due to possible risks to the foetus." In this context, a study led by researchers from the Foundation for the Promotion of Health and Biomedical Research of the Community of Valencia (FISABIO, for its Spanish abbreviation) and the Spanish Consortium for Research on Epidemiology and Public Health (CIBERESP, for its Spanish abbreviation) has shown that there is an association between prenatal mercury exposure and reduced placenta size and foetal growth. The study, carried out within the Environment and Childhood (INMA, for its Spanish initials) mother-child cohort project, aimed to evaluate this link using data on 1,869 newborns from different regions of Spain (Valencia, Sabadell, Asturias and Guipúzcoa). One of the largest studies carried out to date in order to determine mercury levels in umbilical cord blood samples and its association with different reproductive effects: measurements of foetal development (weight, height and head circumference at birth), placental weight, duration of pregnancy and risk of premature birth. The findings, published in the journal 'Environmental Research', show a relatively high average mercury concentration in umbilical cord blood (8.2 micrograms per litre), with a 24% of samples exceeding the WHO's provisional tolerable weekly intake equivalent. "A double in the cord blood mercury concentrations (e.g. a change in the concentration from 8 to 16 micrograms per litre) is associated to a 7.7 gram reduction in the weight of the placenta and also shows a pattern of negative association with the newborn's head circumference," explain Mario Murcia and Ferran Ballester, co-authors of the study. "However no relation was found with other parameters, such as duration of pregnancy." The results of the INMA project suggest that prenatal mercury exposure may, therefore, be affecting the development of the placenta and foetal growth. Although the magnitude of these potential effects is small, reduced placental weight has been linked to the risk of high blood pressure in adulthood. Head circumference, in turn, has been associated with subsequent cognitive development. Despite preventive and surveillance measures are been considered for foods, due to the positive effects on health that are also linked to consuming fish, the researchers urge for public health efforts in order to reduce human mercury emissions. Mario Murcia, Ferran Ballester, Ashley Michel Enning, Carmen Iñiguez, Damaskini Valvi, Mikel Basterrechea, Marisa Rebagliato, Jesús Vioque, Maite Maruri, Adonina Tardon, Isolina Riaño-Galán, Martine Vrijheid, Sabrina Llop. “Prenatal mercury exposure and birth outcomes”. Environmental Research (2016) 151: 11–20. José García-Calvo, Saúl Vallejos, Félix C. García, Josefa Rojo, José M. García, Tomás Torroba. “A smart material for the in situ detection of mercury in fish”. Chemical Communications (2016) 52, 11915.